We at TCT don't always take ourselves too seriously and this month's Podcast certainly makes that abundantly clear. 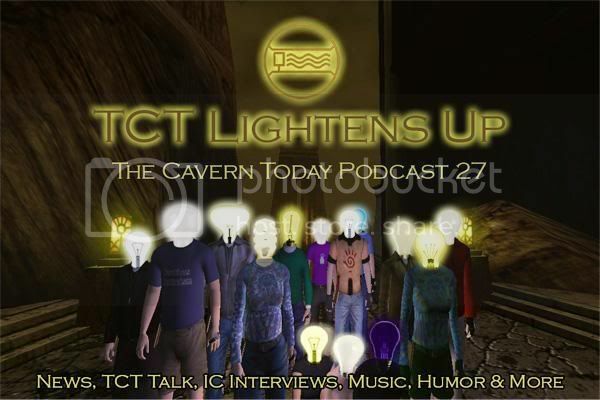 The 'cast has a rich assortment of "lightness" and if you have missed out on the "Scars" episode or "A New Light" of MystOnline, our panel on the TCT Talk segment of this Podcast will definitely bring you up to date. Dalken Starbyne has an excellent news segment, Shaeri has a "Thought for the Podcast," another wonderful musical piece "Ercana" by our own Jeff Wise, a new thrilling episode of the serial "Journey of the Called" with great sound effects by Donahoo and more! Last edited by essjay on Tue Jul 03, 2007 5:36 pm, edited 1 time in total. Last edited by Dean on Wed Jul 04, 2007 11:06 am, edited 1 time in total. Oy, another long one... this might take a while! I'm really glad you guys liked TCT Talk! It's actually one of the more challenging features to produce, since the "script" is only a list of topics, and we ad-lib most of the content. That's not always easy. Besides, I'm always left with the misgiving that what's funny to us might not be funny to the majority of our listeners; in addition, I always go into these "live" features hoping that I'll be quick enough to "improv" well, and be entertaining as well as informative. I hate to think of snappy comebacks after the recording's all done. So it's a relief to know that somebody's enjoying it! The whole idea is to make it all sound natural and unscripted, which for the most part it is. It's also great practice for us, in that we're learning to be more and more at ease in front of our microphones. Last edited by Mowog on Tue Jul 10, 2007 6:10 am, edited 1 time in total. The TCT talk is usually my favorite segment. I work a lot, and tend to miss most of the events that happen in The Cavern, and listening to TCT talk makes me feel as though I'm just hanging around with you guys discussing the events in the cavern and getting caught up. Maybe it's just me, but I picture sitting around in a coffee house and just having a friendly conversatin about Uru with you all, even if I'm not actually doing the talking. Thanks Jeff, that's really reassuring! The "coffee house" effect is exactly what we're shooting for with TCT Talk, and it is truly cool to know that you perceive it that way. We kind of like when they run long too, as long as we can fill them with good, solid information. And that's a challenge I didn't mention above; keeping things on track. It's not hard at all to take off on some silly tangent, and we make a conscious effort to avoid that. We don't always succeed; if you ever hear Shaeri call out, "Chipmunk Hole! ", it means we've gotten lost again. Some of the random silliness gets edited out, but some gets left in as well, if it adds something to the piece. We also try to avoid spoilers, and any inadvertent slips are edited out. I've only been in on the last two TCT Talk installments, but I hope to become a regular participant. IMHO, the segment comes closest to our overall purpose; bringing news and entertainment to the Uru fanbase. I just wanted to point out that there was in fact a slight error in the podcast. In the closing statements, Mowog incorrectly stated that Montgomery had read aloud the open letter when in fact I did. Yes, we know there was a slight mess up there. The goal for the next podcast will be to have all of the staff members' names correctly reflected in the storyboard so that whoever scripts the credits will get those things correct. So . . . you want to be credited next time, make sure your name is in the storyboard, or I will have no choice but to remind you again. [img]http://www.chirpspace.com/tct/style_emoticons/<#EMO_DIR#>/laughing.gif[/img] What was the deal with that, anyway...? basically, when J'nathus wants to get a bit egotistical (ie most of the time) he reverts to 'The' J'nathus.